Download "PPI 1 in IDA Countries, 2009 to 2014"
1 PPI 1 in IDA Countries, 2009 to 2014 This note is a product of the Public-Private Partnership Group of the World Bank, and the Private Participation in Infrastructure Database (PPI Database), written by Henry Kasper and edited by Alexander N. Jett. 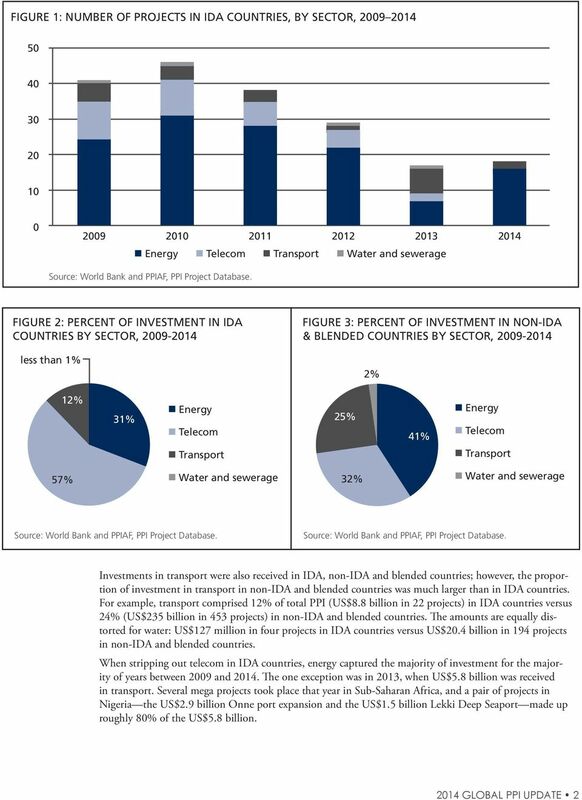 OVERVIEW Private investment 2 in infrastructure 3 in IDA 4 countries from 2009 to 2014 totaled US$73 billion. Over the same six-year period, 189 projects 5 attained financial closure in four sectors: telecom, energy, transport, and water and sewerage. Of these projects, the vast majority of deals 128 of were in energy; telecom followed with 35; transport had 22; and water had four. 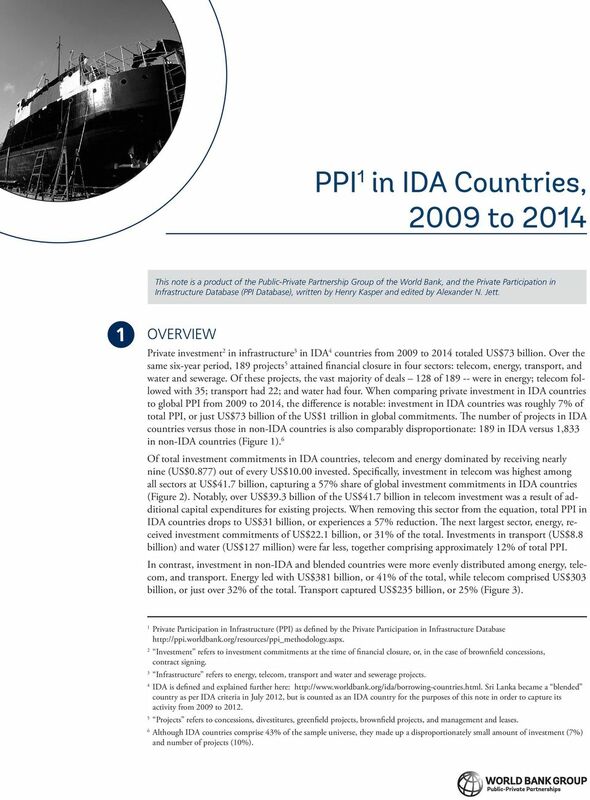 When comparing private investment in IDA countries to global PPI from 2009 to 2014, the difference is notable: investment in IDA countries was roughly 7% of total PPI, or just US$73 billion of the US$1 trillion in global commitments. 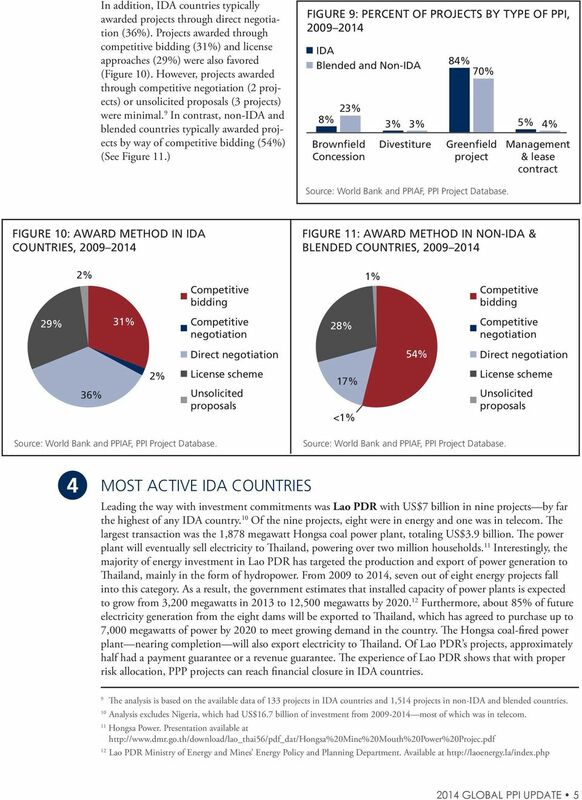 The number of projects in IDA countries versus those in non-ida countries is also comparably disproportionate: 189 in IDA versus 1,833 in non-ida countries (Figure 1). 6 Of total investment commitments in IDA countries, telecom and energy dominated by receiving nearly nine (US$0.877) out of every US$10.00 invested. Specifically, investment in telecom was highest among all sectors at US$41.7 billion, capturing a 57% share of global investment commitments in IDA countries (Figure 2). Notably, over US$39.3 billion of the US$41.7 billion in telecom investment was a result of additional capital expenditures for existing projects. When removing this sector from the equation, total PPI in IDA countries drops to US$31 billion, or experiences a 57% reduction. The next largest sector, energy, received investment commitments of US$22.1 billion, or 31% of the total. Investments in transport (US$8.8 billion) and water (US$127 million) were far less, together comprising approximately 1 of total PPI. In contrast, investment in non-ida and blended countries were more evenly distributed among energy, telecom, and transport. 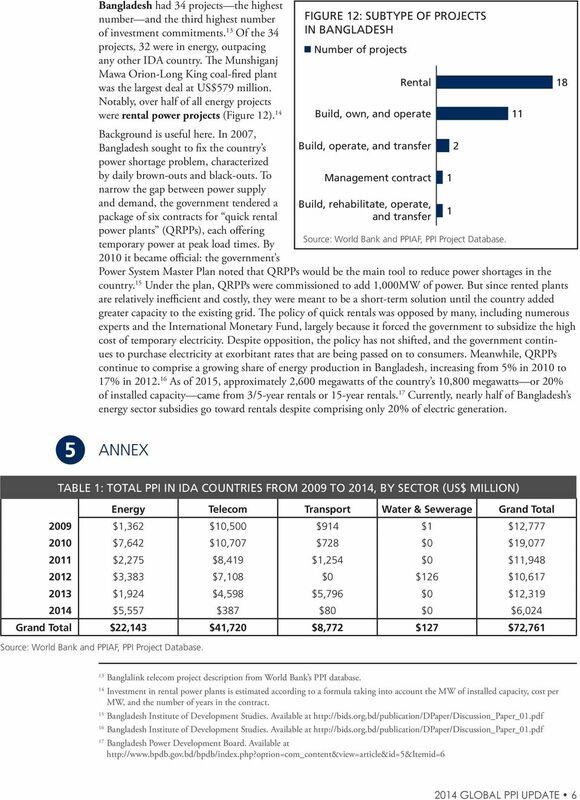 Energy led with US$381 billion, or 41% of the total, while telecom comprised US$303 billion, or just over 3 of the total. Transport captured US$235 billion, or 25% (Figure 3). 1 Private Participation in Infrastructure (PPI) as defined by the Private Participation in Infrastructure Database 2 Investment refers to investment commitments at the time of financial closure, or, in the case of brownfield concessions, contract signing. 3 Infrastructure refers to energy, telecom, transport and water and sewerage projects. 4 IDA is defined and explained further here: Sri Lanka became a blended country as per IDA criteria in July 2012, but is counted as an IDA country for the purposes of this note in order to capture its activity from 2009 to Projects refers to concessions, divestitures, greenfield projects, brownfield projects, and management and leases. 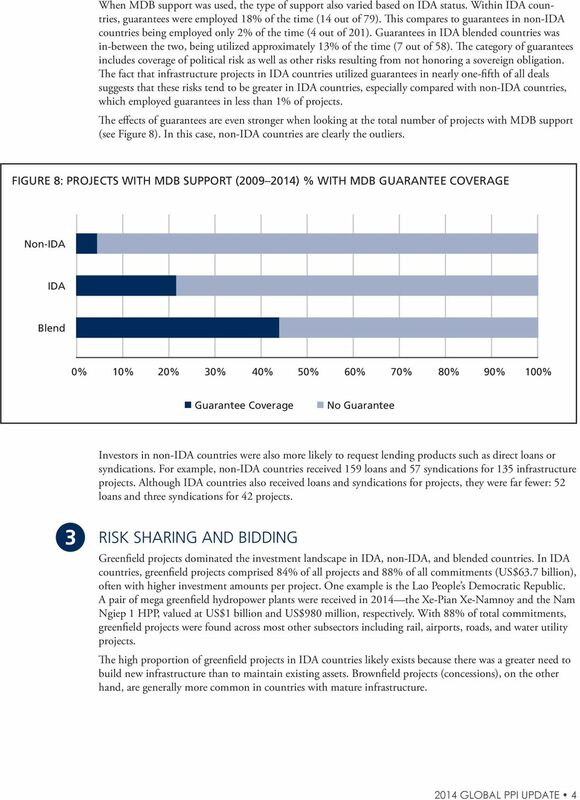 6 Although IDA countries comprise 43% of the sample universe, they made up a disproportionately small amount of investment (7%) and number of projects (10%). The World Bank Group. World Bank and IMF: Differences. World Bank and IMF: Differences. 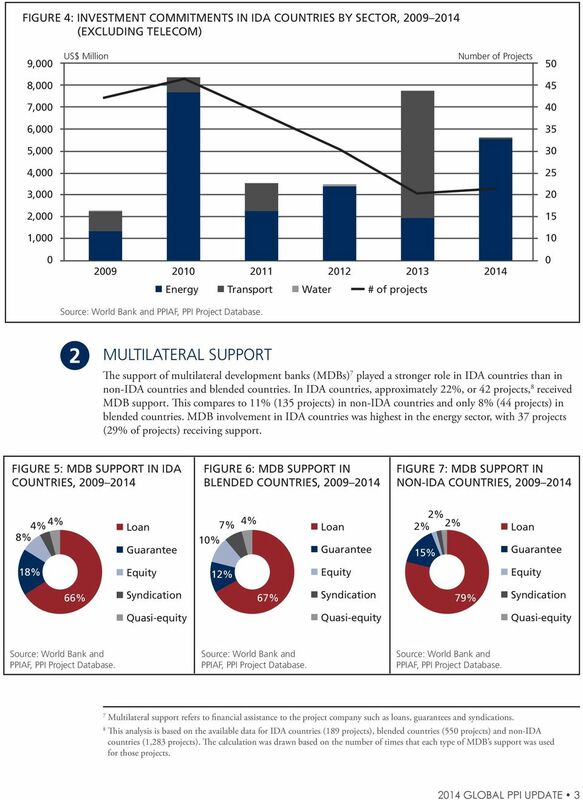 What Does the World Bank Do? 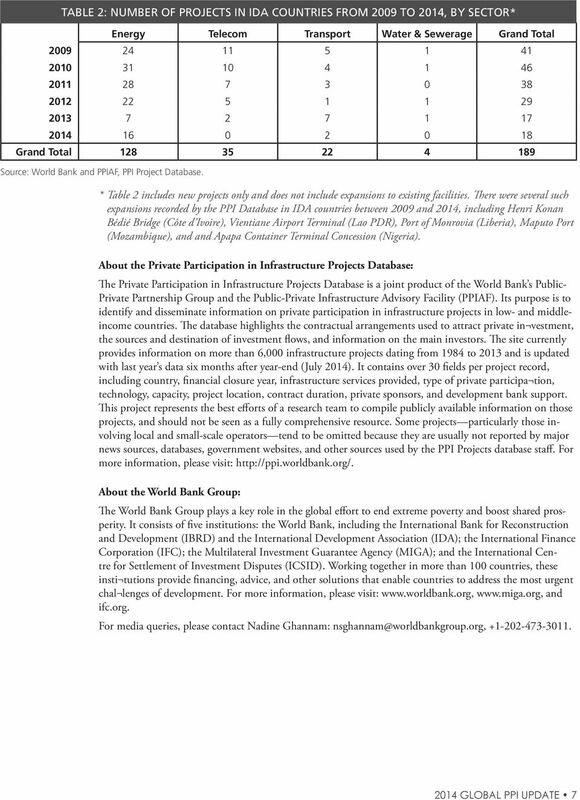 The Greenfield IPP Database (GRIPP): Based on the World Bank s Private Participation in Infrastructure (PPI ) Database. Amanda Beery & Robert T.
2. IFC s Global Trade Finance Program: Objectives and Design Chapter Highlights IFC introduced its current trade finance model in FY05 to support the supply of trade finance to underserved clients globally. Blended Finance at IFC BLENDING DONOR FUNDS FOR IMPACT Blending concessional funds alongside IFC s own allows us to increase our reach and achieve more development impact than would otherwise be possible. TERMS OF REFERENCE FOR THE DEVELOPMENT OF RESOURCE MOBILZATION STRATEGY AND PROCEDURES FOR EBID May 2014 ToR for the Preparation of Resource Mobilization Strategy and Procedures for EBID Page - 1 - I.
Infrastructure Investing: In a class of its own? Toward a Low-Carbon Economy: Renewable Energy and Energy Efficiency Portfolio Review A number of factors are influencing the trend in World Bank Group support for renewable energy and energy efficiency. An Investment Framework for the ICT Incubator Fund A key task of the Sustainable, Replicable ICT Incubator Study was to understand the investment environment in which incubator organizations must operate.